Tom Brady got the better of Aaron Rodgers on Sunday but he and Bill Belichick credited the New England Patriots defense for the win. 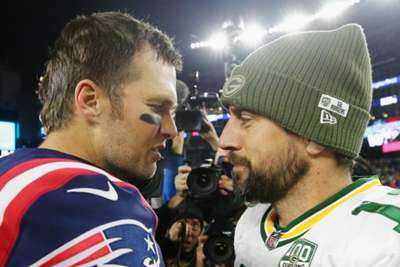 Quarterback greats Brady and Rodgers were facing each other for just the second time in the NFL at Gillette Stadium and the Patriots star came out on top, leading a 31-17 win over the Green Bay Packers. Although it was a big night for Brady as he further bolstered his reputation up against an elite rival, the 41-year-old praised his defensive team-mates for limiting Rodgers and Co.
"I thought we played great defensively," Brady told reporters. "They made some big stops for us. "Offensively, we had some plays that we all would have liked to have done a lot better job on. But we made some plays in the fourth quarter when we needed to and anytime you beat a good football team, it feels good. "So, 7-2... it's a long way from 1-2, where we were. We strung together a lot of wins playing good football and we've got to keep it going." Even in defeat, though, Rodgers impressed Patriots head coach Belichick. "He's just so hard to get. He has such presence in the pocket," he said. "We pressured him. "I thought he had to make some throws with kind of the line closing in on him and wasn't able to really get to make the kind of throw that I think maybe he wanted to make. But God, he's a hard guy to get. "You look at the pictures – everybody's where they're supposed to be. We feel like we had a good rush plan against him and he escaped a couple of times and extended plays and then got out and threw the touchdown there on a scramble. "It looked like we had him on that. It looked like we had him on a lot of plays, to be honest with you. He's just so good. "Then, of course, the accuracy throwing the ball in addition to him getting out and getting away from the rush. I thought our guys did as good a job as they could do. Really, he's just tough. He's just tough to get."